In the next issue we look at East Africa Longest Railway Tunnel. Published by Group Africa Publishing Ltd Head Office and for all enquiries: Consolidated Bank House, 4th floor, Koinange Street, Nairobi 00100 Kenya, Tel: +254 772642042, +254-20-2213607 Email: info@groupafricapublishing.com Uganda Agent Projects Unusual Uganda Ltd. Jemba Plaza, Luwum St. Kampala, Uganda Tel: +256 776 883181 bettykatongole@yahoo.com Botswana Agent Cadline (Pty) Ltd. P/Bag 494 Gaborone, Botswana. It’s not just about ICT when it comes to smart cities in Africa As mass urbanization continues across Africa, putting in place the fundamental infrastructure needed to build smart cities has never been more important. Buying paint is an important decision for any property owner. When it comes to paint, more money usually does buy you more durability; a top-quality can of paint will contain a higher percentage of titanium oxide — the solid pigment. 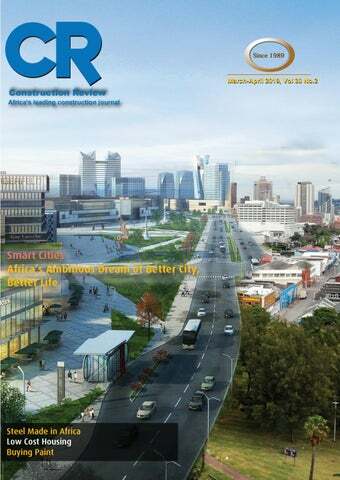 Smart cities are emerging in Rwanda, Nigeria, Egypt and Kenya. For all of them, the first hurdle is installing the ICT infrastructure, but the capabilities required to kick-start smart city services and efficiencies reach beyond ICT. Smart cities don’t just deliver cost savings and efficiencies; creating a sustainable enabling environment can impact economic potential and growth. In Africa, a dearth of infrastructure provides a Greenfield opportunity to get it right first time. However, strategic planning will be key to success. Low-Cost Housing Depending on the country and culture, there are many different approaches to the creation of affordable living space. ICT may be the core upon which smart cities are built, but getting buy-in from stakeholders to deliver smart services means building relationships – putting in place processes and integrating systems and implementing the right controls, security and management systems. What is crucial is that they can be implemented by local people using the locally available materials. As infrastructure is rolled out, citizens connect and services go live; cities become smarter. To put the fundamentals in place, smart governments and developers should choose partners that have strong technical and technology expertise but also broader integration, orchestration, strategic and management capabilities. Evans Avundiku (left) a PG Bison Trainer demonstrates how to fix a motion runner on a drawer board to Wilson Andeche (right), an artisan at the Company’s Blum Training Centre. PG Bison has trained more than 600 artisans (fundis) to design. FPT Industrial is broadening its business in Africa & Middle East through a partnership with a new dealer in Egypt. M. Ahmed Daoud & Co, with its main office in Cairo, is now responsible for sales and service of engines for industrial applications, power generation, agriculture pumps and firefighting. The dealer will also provide stock and sales of genuine FPT spare parts. MBK expands its range of products with new cage welding machine MBK Maschinenbau GmbH has long been known in the industry for its innovation. As one of the leading manufacturers in the welding machines and reinforcement systems for the civil engineering and the concrete precast industry, the global player responds promptly and flexibly to the requirements of a rapidly changing and innovative market. FPT Industrial already has a strong presence in Morocco, Algeria, Tunisia, MBK is constantly working to Democratic Republic of Congo, continually improve and expand Angola and South Africa. its large product portfolio to PG Bison, one of the largest manufacturers of MDF and particle Solid experience in the provide solutions to customers board furniture components in Kenya has in the recent years trained power generation segment around the world that can generate more than 600 artisans to design, fabricate and install kitchen cabinets, wardrobes, shop fit-outs and office furniture, and use proper The partner was chosen because of real competitive advantages. tools for the assembly and installation work. its solid experience in the power generation segment, technical In all developments, the individual PG Bison has a list of trained artisans who can be recommended to product expertise and after sales requirements and needs of clients who purchase their products. These are carpenters who have services efficiency. the customers are taken into gone through the structured training and PG Bison has inspected account and this high degree of their work at various sites to ensure that they have met the required For FPT Industrial, Egypt is a standards. individualization is professionally strategic country for its commercial realized. operations in North Africa and The training of artisans by PG Bison has encouraged the shift from in the Middle East, and the the use of solid wood to wood-based panel products. This has collaboration will bring valuable With the new cage welding resulted in a higher level of cabinet finishing in homes and offices outcomes for its business machine ASM for the flexible that is comparable to that found internationally. production of reinforcement for The new dealer is well known and The raw materials for their panels are sourced in South Africa from driven and bored piles as well respected in Egypt, with a deep responsibly managed, sustainable and renewable “man-made” familiarity on how to offer the right as supports and masts, MBK forests, and do not cause forestry degradation on the continent. solution for local customers. expanded its range of products. In recent years with the furniture industry shifting from using solid wood to other wood based products like medium density fiberboard (MDF) and particleboard, traditional carpentry hand tools are being replaced with modern power tools. 64Door Factory opens state of the art production facility in Nairobi 64Door Factory, a manufacturer of interior wooden doors recently launched its investment in Kenya after opening of a state of the art production facility in Nairobi worth US $2.4m. The company targets to provide high quality interior door sets and installation service to the building industry in East Africa. The launch further reinforces Kenya as a preferred foreign investment destination in the region. Mr Nyamu Wanyoike director 64 Door Factory ltd, Patrick Bucha , Secretary State Department for Housing and Urban Development, Ms Kadri Humal Ayal, Estonian Honorary Consul and Tobias Alando, Head of Membership, Kenya Association of Manufacturers, during the launch of 64Door Factory in Kenya. 64Door Factory has a large stock of different doors in its factory facility in Nairobi which enables the company to provide services to individual builders as well as small and large-scale construction projects with short delivery and installation times. The factory has the capacity to produce over 50,000 doors annually. The door factory comes at a time when the Goverment of Kenya is aggressively fostering the Big 4 agenda: manufacturing, food security, universal healthcare and affordable housing. This project is timely and will buttress the twin pillars of housing and manufacturing. By manufacturing in the country, the company will facilitate technology transfer and human capital formation through skills transfer to local staff. Manufacturing Indaba East Africa, 7-8 May 2019 – Nairobi, Kenya Manufacturing East Africa is borne from the success of the Manufacturing Indaba conference & exhibition which is hosted in South Africa, annually. There has been a call from the South African manufacturers to expand and sell their products and services into Africa and to explore business partnerships and synergies with a focus towards Regional Integration. Manufacturing accounts for about 70% of global trade and about 80% of global business R&D (McKinsey Global Institute 2012). After 20 successful editions of Buildexpo in Kenya and Tanzania, East Africa’s largest building and construction fair has now ventured into the Rwandan market. Buildexpo Africa is the only show For more information about how to attend, visit www. with the widest range of the latest africa-energy-forum.com or contact AEF@energynet.co.uk technology in construction machinery, building material machines, mining Date:14 June 2019 machines, construction vehicles and construction equipment. Manufacturing thus remains a driver of economic prosperity in advanced economies.The global environment in which the Eastern Africa manufacturing sector develops going forward will be greatly different compared to that which manufacturing sectors developed elsewhere in the past. Countries dominant this year are Germany, China, India, Saudi Arabia, UK, USA and Italy with several leading international brands looking to build a solid foundation in the East African market. It will be held at the newly built Kigali Convention Centre ( KCC ); one of the most modern and expensive buildings in Africa. This has significant implications for Eastern Africa policy. In partnership with RDB (Rwanda Development Board) the 2nd edition of Buildexpo in Rwanda will provide an international business platform by enabling global investment opportunities and business. et’s admit it, construction contracts are long, boring documents. So, why spend the time reading those papers page by page, right? This article is for those currently searching the key elements, terms and provisions that must be included or reviewed in any contract entered into with a general contractor, homeowners, and/or a subcontractor. must specify the time frame when you are expected to work. This includes the commencement date and target completion date. By adding the “time is of the essence” clause, you are advised to provide an ample crew to perform the task at the exact time. This is usually instructed at the start of your work. Scope of Work Normally,you will be working for a person that you have met recently — a client to be exact. But that doesn’t mean you will do everything he says. Termination Clause This details the situations under which the parties may end their legal relationship and discontinue their obligations under the agreement. The law allows the parties to terminate the agreement by mutual consent if one has breached the contract. A contract must set forth the job description of what the contractors have agreed to perform. This must be written very specifically to prevent any misunderstanding and confusion. Adding termination clauses in your construction contract is necessary. This can let you escape from a homeowner who is not paying you at the right time and in the exact amount. A contract also states that you must comply with all existing project plans, specifications and building codes. By specifically setting forth within the contract the scope and non-scope of the work of the contractor, discrepancies in the future as to the duties and obligations of the contractor will be greatly minimized. The clause may expand or limit the common law right to terminate and may contain the following termination events, which may be mutual or unilateral, and optionally include a right to cure. payment so better make sure that the progress payment method is clearly stated. However, the Security of Payment Act can always help contractors, builders, and subcontractors by protecting their legal rights to payment. The payment clauses are the first thing you should consider. So you better add a payment term section in your contract if you want to prevent any conflicts to happen. Dispute resolution clause The dispute resolution methods are needed whenever each party find themselves stuck in a conflict or issue. We have many methods to resolve a dispute such as meditation, arbitration, adjudication, and litigation. Incorporating dispute resolution clauses are essential parts of your construction contract so it should be well-drafted and clear. There is a 90% chance of you getting into a dispute within a project so you better be prepared when this happens. No damage for delay clause Each builder must always carefully examine the contract documents to know if there is a no damage delay clause within the contract terms. This provision implies that whilst the contractor or subbie is not entitled to a claim for delay damages, he will be entitled to an extension of time; and the risks that may be encountered during the building process should be included in the contract. Better City, Better Life: Building sustainable and resilient cities Sustainability is a lens through which the planning, project delivery, and development processes focus to achieve the needs of the communities today without sacrificing capacity for future generations. Alison Groves, The Regional Director Africa of WSP Building Services. ities already account for approximately 70-80% of the world’s economic growth, and this will only increase as cities continue to grow. In the next 35 years, the population in cities is estimated to expand by an additional 2.5 billion people, almost double the population of China. As a vital component for connectivity, public health, social welfare, and economic development, infrastructure in all its forms – basic, social, and economic – is critical for the anticipated urban growth. As a day to promote the international community’s interest in global urbanization and contribute to sustainable development around the world, 31st October marks World Cities Day – where the spotlight on building sustainable cities comes to the fore. “Globally, the annual investment required to cover the gap for resilient infrastructure is estimated at US $4.5-US $5.4 trillion,” said Riaan Graham, sales director for Ruckus Networks, sub-Saharan Africa. In Africa, resilience and livability must be the desired outcomes sought through planning and design processes. Achieving these outcomes will require respecting and balancing local environmental, social, economic, and climate risk priorities. “On one end, we have cities and urban centres that are faced with challenges to the maintaining the capacity of existing infrastructure networks. These nodes still boast long-term infrastructure planning, which includes introducing smart technologies into their city scape that will make these cities more connected, innovative and nimble in the face of future disruption. At the other end of the cycle, however, we have vast areas that are underdeveloped, geographically dispersed, remote, and with limited accessibility to-and-from the nearest urban node.” Groves believes that to be able to support continued and future growth – of populations, industries and economies – long-term planning must be approached with a vision to compensate for both ends of the development cycle and everything in between. “As we look to build cities and spaces for rural communities that are livable, resilient to disruptions, and future proofed, sustainability is the way to get there,”affirms Groves. “Sustainability is a lens through which the planning, project delivery, and development processes focus to achieve the needs of the communities today without sacrificing capacity for future generations. A sustainability lens always includes balancing priorities across several areas, including the economy, community needs, and environmental quality, but also equity, health and well-being, energy, water and materials resources, and transportation and mobility needs,” adds Groves. Resilience and livability Urbanization, demographic shift, environmental changes and new technologies are reshaping the way city leaders are looking at sustainability as well as creating and delivering on public services to address these new dynamics, and the rise of Smart Cities is the response to these challenges. Smart cities will help address the economic and social inequality that this divide creates, by providing Internet access to all citizens. “With robust networks in place, bridging this divide will help bring communities closer together and encourage citizens to play a more active role to local councils. Flawless connectivity will improve city infrastructure and make it possible for citizens to engage with their community, such as removing the roadblocks that complicate access to local services,"he says. "We are already seeing significant foreign direct investment into such key ICT initiatives across the continent, but sustainability has to be at the heart of this if Africa is to create a resilient framework for better cities,” adds Graham. “In Africa, resilience and livability must be the desired outcomes sought through planning and design processes. Achieving these outcomes will require respecting and balancing local environmental, social, economic, and climate risk priorities through a robust planning and data-driven design process,"he says. "Ultimately the goal should be that we are building livable spaces that are people-centric, integrated, connected, smart, nimble and resilient – where societies can thrive, well into the future,” concludes Groves. Egypt’s new capital is an ambitious project by any standards when you consider that it will boast a park double the size of Central Park in New York City. The case of Kenya In 2008, the Government of Kenya approved the creation of Konza Technology City, which would be a pioneering technological city not only in East Africa, but in the entire continent. As part of reaching the country’s Vision 2030, this smart city will not only be sustainable and will be a world class technology hub, but will also be a major economic drive for Kenya. Konza was initially conceived to capture the growing global Business Processing Outsourcing and Information Technology Enabled Services (BPO/ITES) sectors in the country, which has been generating revenue for the country. According to government estimates, BPO/ITES business produced US$110 billion in revenues in 2010. Revenues from this industry were expected to increase three-fold to US$300 billion by 2015. The first phase of Konza Techno City is expected to create over 20,000 new jobs, both directly and indirectly. The city, which is being built on a 5,000 acre piece of land in Malili Ranch, is being developed as a public-private partnership, where the government will take a minimal role in developing the public infrastructure and setting up regulatory guidelines. Konza Technology City is set to be a pioneering technological city not only in East Africa, but in the entire continent. Despite its ambitious nature, Konza City has a few challenges, with the greatest among them being its location. The techno city is approximately 60 kilometers away from the capital city of Nairobi, which houses major businesses and offices especially in the ICT sector. The long distance has discouraged people from taking part in the city as most consider Its construction is planned as a mixed-use, it hectic mostly because of the immense high density walkable city that will be able traffic jams on the roads leading to Konza. to accommodate a diversity of districts and Because of its ‘less strategic’ location, it will programs. The city will be a livable, sustainable urban environment that will encourage high-value be difficult to move businesses as well as financial and investment institutions there. development. According to the government, the project is divided into four phases that will take It will also be an integrated urban information five years each, depending on uptake by and communication technology (ICT) network. investors. A smart city framework will be put in place to integrate four key city services, and these However, investors have also raised are: infrastructure, citizen services (access and concerns and want the government to assure participation), city services (city information, them that the project will have a steady planning and development), and business low cost energy as well as sufficient and services. In detail, the city will feature a uninterrupted water supply as stated in the central business district, a university campus city’s plan. Until then, the investors will with a capacity of 1,500 students, a residential hold on to their funds. community of 185,000 people and parks and wildlife. So far there has been adequate progress, with the government saying that in the next three years it will have completed the infrastructure necessary for a modern techno city. A 40 -kilometer road network will be constructed within the city, along with a fiber cable and electricity reticulation that will be underground. This will enable the city to be operational 24 hours a day. aerator to create an organic water flow. being established or upgraded to meet this demand. The mills produce galvanized wires, roofing sheets, nails and reinforcement bars for concrete while giving birth to other downstream industries which fabricate wheel barrows, farming implements and water tanks among a myriad of other products. The establishment of the steel rolling mills has meant the creation of jobs both directly and indirectly while local production of finished steel products has meant that hard currency that would have gone into importing the products has been saved. Kenya’s annual demand for steel is estimated at about 480,000 tons to 600,000 tons. The following are some of the biggest steel millers in East Africa which contribute to infrastructural growth in East Africa. infrastructural growth in East Africa. stablished in 1930, Doshi Group has diversified interests in manufacturing and trading which include Steel, PVC/PPR/HDPE pipes & fittings, Electrical products, Power/Telecommunication cables and General Hardware. Doshi & Co (Hardware) Ltd is one of its kind manufacturing entities in Africa producing a comprehensive range of Steel, Electrical and Plastics based products for water systems, irrigation, building, mining, automotive, gas and plumbing industries. Their core strength lies in their ability to foresee and identify evolving customer needs, build up competencies and match them with needs. They have successfully translated this expertise into providing value added products, with focus on customer relationship management and services. True to their business philosophy, a couple of years ago they enhanced theirmanufacturing capacity by installing a state of the art, one of its kind,high precision European tube mill. The mill produces unmatched quality of steel tubes (Square, Rectangular, Circular) with exceptionally tight dimensional tolerances, perfect profile shape, exact length and a very strong weld. Doshi is constantly looking for innovative solutions that can help improve their customers’ productivity and also reduce costs.One such product is PreGalvanizedSteel Tubesin square, rectangle and circular shapes. These are sold under the Galtron brand. These are best suited for structural and general fabricationapplications that are exposed to humidity and the elements. By using Pre-Galvanised Tubes, the recurring cost of paining every few years to avoid corrosion is totally eliminated. These tubes can last for over twenty years without requiring any maintenance or painting. This is a huge saving over the life of the product. Green-house manufacturers, now do not need to depend on imported tubes as Doshi can produce them locally, confirming to the highest international standards and deliverthe required tubes in the required lengths, just-in-time,in both small as well as large quantities. Another innovation from Doshi is their ability to produce High Tensile Tubes for structural and mechanical engineering applications including superframes for buses. They are the first company in East & Central Africa to manufacture High Tensile Tubes which are marketed under the HyTen 355 brand. These HyTen 355tubes can be used in all structural and mechanical engineering applications. The biggest advantage of using these tubes is the high strength to weight ratio. Proper design and use of these sections can lead in savings of weight of up to 25% in the weight of the structure as compared to the normal tubes of commercial quality. Hence a very big saving on the ultimate cost of the structure or project. Doshi also offers CNC cutting and drilling services. Key benefits are, enhanced productivity where fabrication time is reduced by as much as 50%, reduction in inventory cost by increasing the throughput in the fabricator’s workshop and saving in shop floor space, accuracy and precision, improved cash flow for the fabricator due to reduced fabrication time. Doshi have embarked on a journey of consistently adding value to the customer’s business and this business model has propelled their growth. TUFFSTEEL LIMITED Construction Review spoke to Tuffsteel Limited Managing Director Dev Mukund Patel on his company’s products and well as the steel industry in general. Are you a manufacturer, distributor or retailer of steel products? If not a manufacturer, where do you source your products from? Tuffsteel Limited is part of the well-established group of companies as a stakeholder of Corrugated Sheets Limited and Mombasa Cement Limited. Through our longstanding partnerships with some of Kenya’s leading and expert manufacturers in steel and cement industry,we specialize in the importation and distribution of a variety ofsteel products, cement, bitumen and all other building and construction needs. Tuffsteel is the go to distributor for all construction materials. How long have you been in business? Tuffsteel Limited was incorporated in June 2007 and has grown to be known in the market as the leading factory outlet for all steel and cement products. Where is your business located and do you have branches elsewhere? Tuffsteel Limited Headquarters is located on Mombasa Road–Nairobi. Who is your target market? Tuffsteel Limited trades and distributes a wide spectrum of quality building material to a wide spectrum of consumers. Tuffsteel has supplied to numerouswell established contractors, engineers, developers, general consumers looking to expand/construct their own private structures. Whether it is the fabrication of your dream home or the construction of multi-phased developments to high-rise developments we ensureyou’re your construction needs are cateredall from under one roof. We are Kenya’s “One Stop Solution” for all your construction needs. What makes your products unique and why should customers prefer you to others providing similar products? Our quality assurance on all our products offers customers the ultimate solutionmaking Tuffsteel theirpreferred suppliedat all times. We stand for good service, reliability and quality products. Over the years, Tuffsteel Limited has prided itself as a one-stop solution for all quality building and construction related materials whereby a customer can visit our offices with their bill of quantities and be supplied with ALL of their material requests inclusive of delivery. We pride ourselves with the ability to deliver on demand for every project through our strong logistics network. With our dedicated fleet of over 100 trucks of trailers, cement bulkers, concrete ready mix transit trucks and lorries, are able to deliver products to all locations country-wide. Whether you are looking for cement, steel products, wire products, pipes and tubes, water tanks or nails, we are the factory outlet of choice! With over 200 products, we cater to all fabrication supplies for small and largescale developmentswith the guarantee of only the highest quality raw material and products. Through the teamwork of every department of theTuffsteel group, dedication, and undeterred efficiency we have proven ourselves asbeing available to serve customers selflessly to ensure all their needs are satisfied. Mention notable projects where your steel products have been used. Buy only that grade of steel, as prescribed in drawing. Check the identification mark on the bars from the manufacturing company. Identification mark will be marked at every running meter of the bar length. There should not be any rust film on bars. Always buy steel bars, which are rust free. Insist on steel certificates conforming to all official Kenyan regulations. Always use a brand of steel bars that is reputed to quality standards and specifications prescribed by the government. Avoid using steel from those rolling mills which use “rerolled or scrap steel” as a raw material. These are likely to have higher carbon content, which are prone to high corrosion. It is advisable to provide steel bars as specified in drawing or as instructed by the structural consultant. Do not avoid consulting the structural consultant to save the fees of the structural consultant. The Quantity You Want to Buy: You should also estimate the exact quantity of steel diameter wise. The wastage of steel bars will cost you highly. You need to work out quantity in advance so you can bargain with the supplier or distributor. Do you believe the industry is well regulated and that standards set by bodies such as KEBS are adhered to? Steel manufacturers are regulated by the Kenya Bureau of Standards (KEBS) who regularly exercise periodic and random visitsto manufacturing plants and outlets including our very own taking samples for testing. Upon testingwe are provided with the necessary results and certifications. It is now common practice for customers to ask for Ensure the weight of reinforcement steel is as these certifications prior to purchasing any product. specified by the prevailing standards. Certification: Request KEBS certification. The certification assures you about its quality as well as the reputation of the manufacturer. This is an indicator of the efforts the regulator has made to educate the general public on the importance of using quality materials. Always ask for “chemical composition” test from the supplier. Apart from other material, the content of carbon is very important. It should not be more that 0.25 percent as it would accelerate corrosion and which will not only reduce the life of building but also will increase periodical repairing work. To ensure full compliance throughout the industry, it will be a positive step forward to see more informative and educative initiatives by the regulator targeted to the professionals and unskilled labor on sites with regard to best construction practices to ensure and enforce the integrity of the industry. Buy Steel Bars after Testing: Always try to learn how to test the materials (Chemical and mechanical tests)on site as well as in laboratory in case of bulk buying. What challenges do steel businesses face and how would you suggest they be resolved? PURPOSE Select the right type and grade of steel bars depending on your requirement or as considered in structural design/ structural drawing by the structural engineer. It is key that the correct grade, strength and quality of steel is used at all times. your construction, but you should notcompromise on steel bars and their quality. They are the definite requirement of your structure and directly related to safety and stability of your house. High cost of doing business:there are certain restrictive costs including –Railway development not applicable anywhere else in the region . –IDF at 2% of the consigment compared to 1.5% in Tanzania. –Taxes:Kenya has one of the biggest tax regimes globally. High cost of financing: despite the interest cap the cost of loans and advances are exorbitant and prohibitive. The steel industry requires access to affordable and easily accessible financing. This will facilitate technological advances in the sector leading to more efficient production and a higher quality of goods. prices from time to time. The regulator needs to put in place monetary policies that would protect the industry from this to ensure its continuity and sustainability. Infrastructure: delivery of products to several regions in the country is still a challenge. Maintenance and improvement of our rail and road network will facilitate efficient delivery more favorable pricing. ononoka Group is a leading manufacturer of steel products in Kenya. From its plants at Embakasi and Dandora in Nairobi, the company supplies a wide range of products that include TMT bars, hollow sections, MS sheets and plates, steel beams, channels, angles, BRC products and many others. The company’s clientele includes Government, traders, building contractors, drillers, fabricators, small, medium and large end users and anyone who requires its products or services. Corporate mission • To manufacture steel building products meeting world class standards by investing in environment friendly technology and manpower. • To import directly quality steel building products from reputable manufacturers and complement the locally manufactured range of products. • To supply both manufactured and imported products through an established distribution network, at affordable prices to boost the housing and building development. Tononoka products have been used on major projects in the country. These include Standard Gauge railway, Outer Ring Road, Two Rivers Mall, Garden City Mall, and ongoing National Assembly Tower among others. “Our products are unique and parallel to none”, says Group Marketing Officer David Kioko. “We always promise our clients quality and reliable steel products and services. Quality products remain our goal everyday”. He adds that the company has made massive cash investment on advanced rolling mill and BRC Machines with key attention being placed on advanced steel manufacturing technology, thereby ensuring that Tononoka manufactures and supplies only the correct and preferred steel product. Mr Kioko advises customers to always insist on steel from reputable manufacturers such as Tononoka. “In our case, look out for our TNK branded steel”. He dismisses the casual approach that suggests “any steel is good steel”. He calls upon industry quality regulators to be more stringent, noting that there are still substandard products finding their way into the market. “Constant visits to mills and hardware stores to test steel can work very well because this will always keep manufacturers and traders on their toes”, he reckons. He also calls for policy-centered actions to help manufacturers mitigate high costs of production, labour and other operation related challenges. uying paint is an important decision for any property owner. This is because the type of paint one chooses will play a big role on not only the appearance of a particular wall but also influences the mood. oil-base because it was more durable and flowed on better. Today oil-based paints use a synthetic oil called alkyd and still require paint thinner to clean up. Natural latex also has been replaced with synthetic materials, usually acrylic, though most paint cans still say latex on them. Today these latex paints are so durable that there is no reason to use alkyd paints indoors. UNDERSTANDING CLIENTS NEEDS Achieving the set goals of the client by providing the perfect coat solutions has necessitated Galaxy Paints and Coatings to rise to stardom in an industry that is fully flooded. The company prides itself in providing high quality paint from vehicle assembly, wood workers, carpenters, contractors, developers, and architects to the general consumers.The organization values theircustomers as they are the epitome of their success stories. To that effect, Galaxy Paints and Coating helps them achieve the perfect coat, by working with them from the specification stage to warrant the application of the right coat. The company guarantees that the client acquires the ideal product for the surfaces that require coating. to operate under the new name Kansai Plascon. quotations, product and colour knowledge. Central Kenya later in the year. as an opportunity to improve people’s lives. Paints, the sky is the limit. products available in the whole country. providing high quality paints to our clients. presently likely to be 4 or less. the appearance of your office, home or factory. year or less when the conditions are right. occupied space to the atmosphere. of a coil if oxidation has been eliminated. resultant constant expensive mechanical failure. best available, he will save you money. he need for affordable living space is high all over the world, especially in cities and metropolitan areas. This is due on the one hand to the growth in population. In many countries, however, it is also due to migration into the cities on account of poor living conditions, crises or natural catastrophes. disadvantages. Derived from experience in Europe, construction with precast concrete elements is an ideal way to manufacture highquality living space quickly and cost efficient. The prerequisite, however, is that the need is correspondingly large and that the planning is consistently tailored to this construction method from the outset. Depending on the country and culture circle, there are a great many different approaches to the creation of affordable living space. What is crucial about these low-cost housing concepts is that they can be implemented by local people using the locally available materials. The use of concrete in housing construction is advantageous in many different ways: its raw materials are available almost everywhere, allowing concrete to be produced locally. Concrete is durable, therefore these buildings can be used over several generations. In addition, concrete houses are stable and are resistant to the weather and termites. easily to the climatic, geological, cultural and traditional needs. In combination with the precast construction method, concrete is virtually unbeatable as a building material. The planning, production and assembly for this construction method are standardised and thus enable a constant, reliable quality with optimum use of materials. That makes costoptimised and resource-saving construction possible. â&#x20AC;&#x153;The low-cost housing concept has a modular structure and can be adapted to the respective local conditions. â&#x20AC;? Low-cost housing concept However, construction with precast concrete elements alone is no guarantee of success: what’s decisive is that the planning is tailored optimally to the respective boundary conditions. That naturally includes the choice of a suitable manufacturing method. Precast plants capable of delivering what is required for a successful construction system cannot be found everywhere. A mobile solution is then required in order to manufacture the necessary construction elements locally. The joint low-cost housing concept was presented at the worldwide biggest exhibition bauma 2016 in Munich, Germany and met with great interest from the trade visitors. In fact, a building developer will be using this system in future for a construction project in South America with more than 10,000 housing units. The low-cost housing concept has a modular structure and can be adapted to the respective local conditions. Mobile Battery Mould (MBM) The transportable precast factory for the production of floor slabs and walls in the immediate vicinity of the construction site. The room concept is suitable for various types of housing, such as two or four-room flats and single or two-storey buildings. The construction is cost-optimized. All parts are manufactured in fair faced concrete, which means that no additional surface treatment is necessary. The individual structural elements are connected using locally available materials such as bolted connections. There are no surface-mounted installations anywhere in the house. All necessary components are manufactured in a battery mould – either stationary or as a mobile/transportable formwork in the form of the mobile battery mould (MBM®). This guarantees that all manufactured precast elements are dimensional and accurate with finished surfaces, i.e. no additional surface treatments are necessary. Production with mobile battery mould direct at Construction Site Battery moulds are an ideal production tool for the low-cost housing concept. They can be used to manufacture solid walls, concrete slabs and flat slabs. Using a standard mould with 20 compartments, each measuring 3.5 m by 7.1 m, two housing units with around 36 m2 of living space can be manufactured per day. The specialists reckon with a period of one day per housing unit for the assembly of the finished panels. The production of the required precast concrete elements takes place using a mobile battery mould from the plant manufacturer Weckenmann Anlagentechnik. Initial situation The worldwide urbanization means that the demand is growing for the faster construction of cost-effective and top-quality buildings with a long service life. Precast concrete elements are generally used for this purpose. However, there are often no stationary precast plants nearby, making transport distances long and thus unprofitable. Solution MBM can bring the production of flat precast concrete parts directly to where it is needed – to the immediate vicinity of the construction site. Thus, MBM offers the construction site all the advantages of the precast technology. After the building is finished, the MBM will be installed on another site within a few days. A typical battery mould has 20 compartments measuring 3.5 x 7.1 m, for instance. A gross production output of approx. 400 m²/day is achieved in this way in a single-shift operation. About 10 truck transports are required per battery mould unit, with one being allotted to the special vehicle. Just a few skilled employees are able to carry out setting up and/or dismantling work within a few days. Consequently, the mobile battery mould is an ideal solution for large temporary building sites. T&C is proud to be associated with Purple Haze to make this project a reality through our partnership with top global brands. Design Partnership Limited enters Top 100 Club Kenyan interior design consultancy, Design Partnership Limited, recently joined the Top 100 Medium-Sized companies Club, a major milestone for a company whose star has been steadily rising since its establishment. offering audit, tax and advisory services. leading Kenyan organizations but also global brands that have seen its work and appreciated its commitment to excellence. Its impressive local portfolio contains such names as Kenya Commercial Bank, Stanbic Bank, I&M Bank, Windsor Golf & Country Club, Securex Agencies, Kenya Association of Manufacturers, Safaricom, Heritage Insurance, Liberty Life Assurance and Mediamax Networks among many others. International clients include IBM, Bank of Africa, Volvo, RTI International, British American Tobacco, AIG and BASF among others. Diplomatic missions such as the Norwegian Embassy and American aid agency USAID have also used Design Partnership services.Among the latest contracts the company has executed is headquarters of the British Broadcasting Corporation (BBC) in East Africa located along Riverside Drive in the Kenyan capital.No challenge appears to be daunting to the highly dynamic and creative team at Design Partnership that is armed with the latest ICT equipment and software to undertake both small and large projects. Clearly, the next few years will be an interesting period to watch as the firm, buoyed by successive wins, continues to scale the heights and firmly entrenches itself as one of the most respected interior design companies in the region. Purple Haze Residences, the firm had to take into account the need to strike a balance on pricing and architecture. On this, the firm focused on a couple of strong parts including a design that allows for horizontal connectivity between people in a community, increasing the living standards by appropriate amenities and offering quality of spaces, an aspect that was missing in majority of Kenyan projects. “Purple Haze is intricately designed and promises a lifestyle which is flashy, homely and community based where you feel a sense of belonging and pride,” explains Mody. This, indeed, is what the project is all about: compact apartments that bring together different components from the best manufacturers from across the globe. These include kitchen fittings from Italy, tiles from Spain and appliances from Germany among other places. Sitting on a two-and-a-half acre piece of land, Purple Haze oozes the feeling of walking down a path to the river. This is because the site is on a terrain sloping towards the Kirichwa Kubwa River and the surrounding regions are low-lying, in a green setting and offer unblocked views of the green Arboretum expanse. The project is segmented in five courtyards that communicate different messages in the aspect of traditional human sense of sight, hearing, taste, smell and touch. These senses are not only projected in the three-bedroom, four-bedroom penthouse apartments but also in terms of amenities. These include a bar lounge, sauna and steam, pool, gym, convenience shop, barbeque area, sculptured courtyards, children’s playground, study room, events room and viewing deck. The project also incorporates natural air vents, a water fountain in the middle of each O-shaped block, ample lighting and greenery at every floor that is designed to ensure people connect with nature. Indeed, integrating greenery has become a key requirement in futurist developments because it not only adds life but makes the building energy efficient and sustainable. Although the developer was keen to ensure that early buyers benefit from the price, many failed to book units preferring to wait until the project is complete. “People have been shortchanged by other developers and this has affected the market,” he notes. Despite the industry challenges that have had ripple effects on Purple Haze, Varsani is confident that sales will pick up ahead of the project’s completion in June. A partnership with Commercial Bank of Africa in which buyers can access financing is also helping in pushing sales. Besides, Edifice intends to keep some units for long -term investment because rental incomes are good with yields projected to maintain a growth trajectory. “We are facing the challenge of a sluggish market but there is a vacuum for good products. The buyers have good knowledge of what they want to buy, so we have the upper hand because these clients come to us,” notes Varsani. That Purple Haze has redefined Kenya’s real estate is with no doubt;the project has won two international awards for its energy efficient and environmental design. The International Property Awards and African Property Awards have been strong statements on the uniqueness of the project and how it has put Kenya and Africa on the world map.More importantly, it sets a benchmark for Edifice, a firm that believes in constantly challenging itself to push boundaries and create unique lifestyles at reasonable prices and develop concepts that ultimately change the way the industry thinks. “Apart from the quality of architecture, Purple Haze offers a high-end lifestyle in terms of facilities,” states Mody. He adds that by studying and projecting the trends in Kenya’s real estate market, Wave was able to create a development that is long lasting. It is for this reason that Purple Haze, which has 216 units encompassing 12 penthouses with 3 and 4 - bedrooms, 100 units with 3-bedrooms and 104 units with 2-bedrooms apartments and 500 parking spaces, has achieved success in attracting buyers with 50% already sold. “We have been successful in sales and all our buyers are very happy because we are giving more than what they expected. This has helped in confidence building and brought about many referrals,” says Varsani.While Purple Haze has been successful in uptake, the fact that homebuyers in Kenya have been short-changed by developers has somehow affected sales. are now a common feature. Authority Pension Scheme has embarked on Bandari Apartments Phase II. have a plinth area of 170 square metres. green aspects to the development. and two high-speed elevators for each block. available on a 24-hour basis from a borehole. the construction period or upon completion. BANDARI APARTMENTS PHASE - II BUILDING ON THE SUCCESS OF THE BANDARI VILLAS A N D T H E B A N D A R I A PA R T M E N T S P H A S E I , W E A R E P R O U D T O B E A S S O C I AT E D W I T H T H E L A U N C H O F BANDARI PHASE-II. 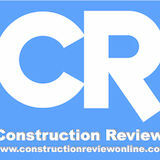 Receive an annual subscription to Construction Review Africa directly in your inbox every month FREE! and also get weekly bulletins on the major happenings in Africaâ&#x20AC;&#x2122;s construction industry.